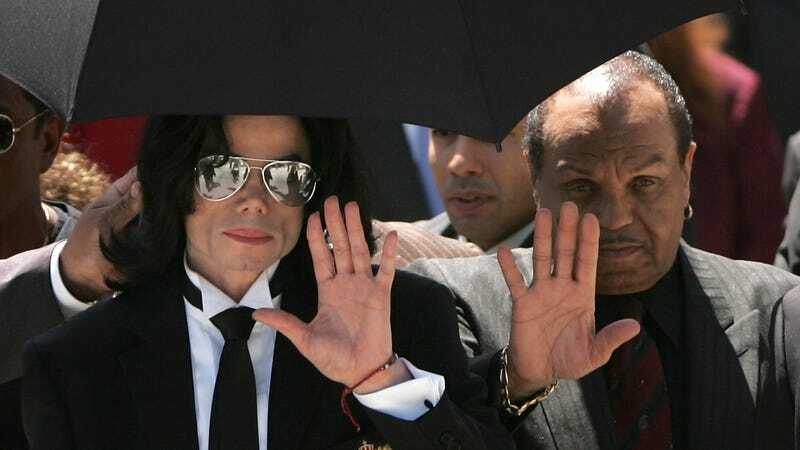 Michael Jackson and his father Joe Jackson (R) wave to fans as they exit the court after hearing the jury declare Not Guilty on all counts in the Michael Jackson child molestation trial at the Santa Barbara County Courthouse June 13, 2005 in Santa Maria, California. Jackson was charged in a 10-count indictment with molesting a boy, plying him with liquor and conspiring to commit child abduction, false imprisonment and extortion. Leaving Neverland, the four-hour documentary chronicling the sexual abuse claims of Wade Robson and James Safechuck at the hands of Michael Jackson has rippled through the 2019 Sundance Film Festival, leaving a bitter chill as cold as the ice caps on Utah’s mountains. Several patrons reportedly walked out in the middle of the screening, and there were counselors on hand to provide support for what was clearly a triggering film ... in myriad ways. According to Deadline, Park City Police increased staffing within their units for the night as protests were expected and there were reported threats against the film’s director, Dan Reed. Arguably, the most visceral response to the screening was from IndieWire’s David Ehrlich, who wrote a review of the film’s world premiere on Jan. 24. “Steel yourself for specifics, as dancing around them would defeat the purpose of this documentary,” wrote Ehrlich, as he went into acutely graphic details of accusations contained within the doc, including a mock wedding ceremony and genital-to-oral penetration. Haven’t seen the film yet, I’ll just say this: I am not ready to watch nor write about it, but I know I will. And a sober reckoning shall be had. Leaving Neverland will broadcast on HBO and the UK’s Channel 4 as a two-night special this spring.